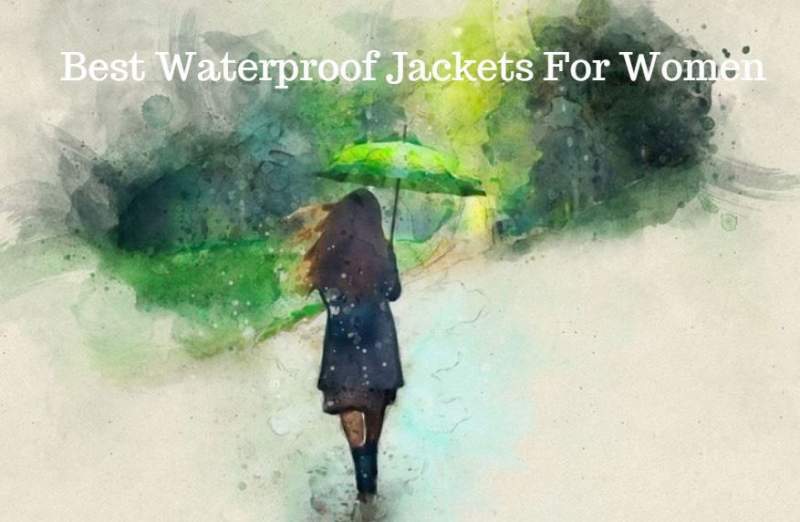 In this text I present my list of 14 best waterproof jackets for women, all very popular, highly rated by customers, jackets that have stood the test of time. Since you are reading this text, then you surely know how difficult it may be to choose a good rain shell jacket. There are many models on the market, customers’ reports are available on various sites, but those reports are frequently contradictory, and it is really hard to know what to choose. I have reviewed quite a number of quality waterproof jackets in the site, and there is also a number of texts where I have presented the properties of materials used in the construction of these jackets. So I thought it would be good to have them in one place with some basic details, and if you want to see more you can then follow the links to my full reviews. which jacket you should choose for yourself. 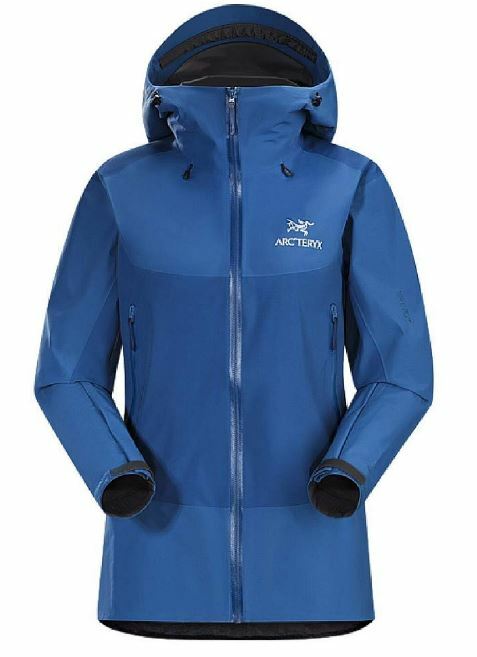 Arc’teryx Women’s Beta AR Jacket. Perhaps it is best to start by explaining the meaning of the words in the name of this jacket, just in case you are not familiar with it. So what is Arc’teryx AR? The letters AR mean ‘all around’. So you have an item designed with high performance and protection properties, yet with all around versatility for a variety of activities. What is then Arc’teryx Beta? This is again related to their jackets for all-around use, and this also implies the features like a moderate articulation, standard fit which allows for layering, moderate length, normal pockets design, but also a helmet-compatible hood. The jacket here is a 3L GORE-TEX Pro with N40p-X 40D nylon ripstop shell fabric, so this is the best in this industry, a rugged waterproof and breathable jacket for all seasons, also very versatile and functional and very lightweight with its 13.2 ounces (374 g) of weight. The jacket is with reinforcements in the shoulders and high-wear areas with 80D nylon plain-weave. The front zipper is a watertight Vislon zipper, and you have 3 pockets (two high-set hand pockets with water-resistant zippers, and one internal zippered security pocket). Note also that you have integrated pit zippers which provide ventilation when needed. The hood is Arc’teryx’s patented helmet-compatible DropHood with all adjustability. This jacket is currently available in 5 great colors. The center back length is 27 inches (69 cm), the length is thus hip-length, and the jacket is best suitable for hiking, climbing, mountaineering, and for casual use as well. 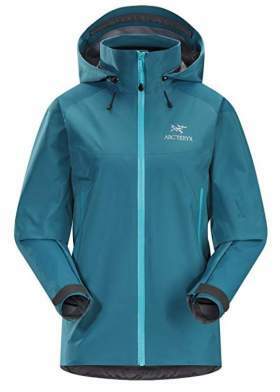 Arc’teryx Beta SL Hybrid Jacket Women’s. This jacket is built with a GORE-TEX fabric with a great balance of weight and durability, with watertight zippers to keep you dry in any conditions. This is an item that will perform equally well in mountains and in the city. The letters SL stands for ‘superlight’, the word Beta they normally use for jackets that are all-around use type. Here this implies a 2-layer Paclite construction but in some areas of high wear you have a 3-layer GORE-TEX fabric. You have a #3 WaterTight Vislon front zipper, an adjustable hem drawcord, and DryCuff laminated adjustable cuff. The hood is fully adjustable and compatible with a climbing helmet. You have two hand pockets with waterproof zippers. The fit is trim, the jacket is the hip length and the center back is 70 cm (27.5 in). The weight is 300 g (10.6 oz). Note that it comes with pit zips, so it is suited for active pursuits. 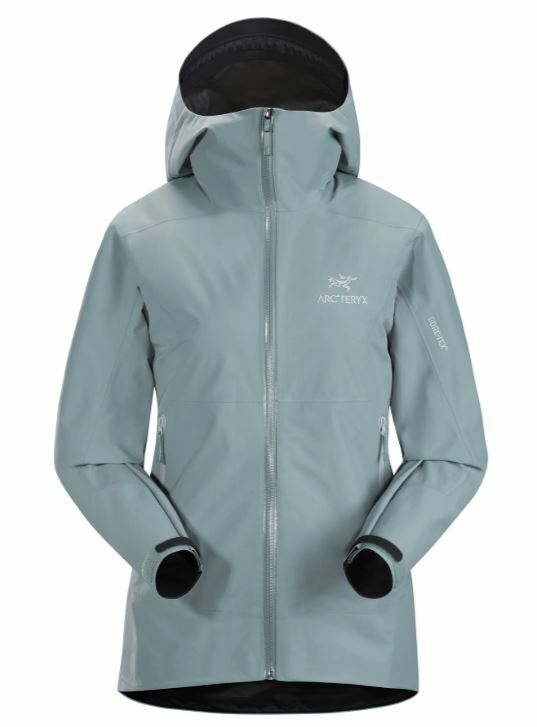 Arc’teryx Women’s Zeta SL Jacket. The word Zeta in the name they use for their lightweight hiking and trekking designs that have an emphasis on comfort and efficiency. The letters SL mean that superlight materials are used and the design is minimalist. So indeed this is a trim fit with hip length and the average weight is only 270 g (9.5 oz). The jacket is built in XS, S, M, L, and XL sizes. This is a jacket for summer hiking and trekking, an item you need for unpredictable mountain weather. So this is an emergency shell for hikers. You have a GORE-TEX fabric with Paclite Plus product technology, so this is a 2-layer type and with fully sealed seams, fully waterproof but breathable. On the front you have a WaterTight zipper, and two hand pockets with RS sliders, note that these hand pockets are rather high so you can use them with the pack’s hip belt. The StormHood is not helmet compatible and it secures with a halo adjuster on the back. You also have adjustable cuffs with Velcro tabs, and the hem is with a drawcord to seal out the old air. So this is a fully reliable item as you would expect from such a top brand like Arc’teryx. As you realize from the picture this is a very long jacket, most suitable for a casual use. You have the GORE-TEX Paclite technology to keep you dry. This is a fully waterproof and breathable construction, fashionable and with an extended coverage. The fabric is polyester and all seams are fully taped. In spite of such a length, this is a lightweight construction, it weighs less than 15 ounces (425 g). It comes with integrated pit zips which allow for ventilation at high temperatures. You also have an attached adjustable hood, and on the front you have a long zipper under a storm flap. The jacket is with two zippered hand pockets, and on the cuffs it has adjustable Velcro tabs. This is a regular fit. 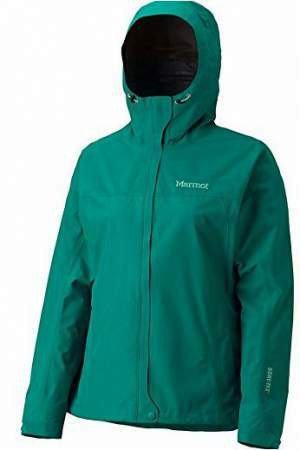 Marmot Minimalist Rain Jacket For Women. You may be surprised to see how many great features this Minimalist jacket has, so the name might be quite misleading. The fabric is polyester 3.6 oz/yd with the 2.5-layer Gore-Tex Packlite membrane, and all seams are taped, so this is a completely waterproof, windproof, and breathable item. The jacket is moderate regarding the weight so you have 14.4 oz (408 g). Its design is such that it allows for layering and you can add a fleece or anything similar and use it throughout the year. The jacket is with what they call the Angel-Wing design, which implies a complete freedom of movement during your activity. The hood is adjustable and with a brim on the front, but you can not roll it away. The main front zipper is with an external storm flap and with a snap button on the hem. Note that you have pit zips for extra ventilation. Please read more in my full review. 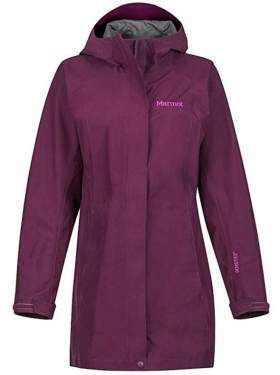 Marmot PreCip Rain Jacket For Women. This is a famous jacket by Marmot and it has been on the market for 17 years already. The material has been improved so what you have now is the most advanced 2.5-layer NanoPro waterproof and breathable membrane. The features of this material are impressive so you have waterproofness 10000 mm, breathability 17000 gm/24h with the Hohenstein RET 5.0 to 5.4. The external fabric is 100% nylon ripstop 2.2 oz/yd. Similar to the Minimalist jacket, here too you have the Angel-Wing design. You have two hand-pockets and the jacket can be stored in one of them, this is convenient because you pack it to such a small volume and zip in with the zipper that is on the pocket. The hood can be rolled away into the collar and it is not removable. It is fully adjustable and helmet compatible. You also have very long pit zips so this together with the high breathability makes this jacket suitable for very hard physical activities. Note that it is available in several great colors. 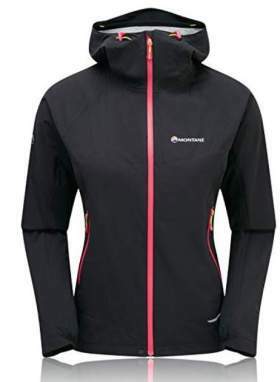 Montane Women’s Minimus Stretch Ultra Jacket. As the name of this jacket suggests, this is a piece which is a 2-way stretch, ultra-lightweight, and with a 2.5-layer 20D Pertex Shield waterproof construction with a durable water repellency for an effective water shedding. The material is with a very high strength-to-weight ratio, and highly breathable, perfect for trail running or other fast-and-light aerobic pursuits. Note that it weighs only 6 ounces (170 g), can you believe this? Compared to other jackets that have a typical industry average of 8 stitch count per inch, here you have them 12 – 13, so these are tight and strong seams. You have a fully-adjustable hem, articulated arms, ergonomic elastic cuffs, and an adjustable hem, all designed for a comfortable fit and uninhibited movements. The jacket is with a 2-point adjustable low profile hood which fits comfortably with headwear. It is with a full-length water-resistant front zipper, a YKK lightweight matte AquaGuard type zip that is highly water resistant. It ends up with a pleasant microfleece-lined chin guard. There are only two high-set hand pockets accessible even if you are wearing a backpack. The pockets are with a mesh lining so they serve also as vents in warm temperatures. The jacket can be stowed inside of one of them. The Montane Women’s Minimus Stretch Ultra Jacket is with an athletic fit that can be worn over baselayers and low-profile mid-layers. It has reflective VIA Trail Series logo details, and rear external Montane hang loop. It is most suitable for hiking, running, and fitness. 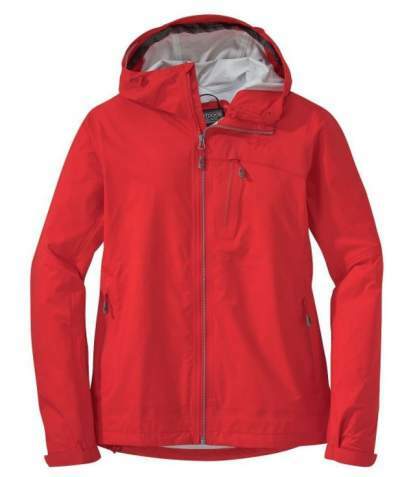 Outdoor Research Aspire Jacket For Women. This is quite a technical and award-winning waterproof and breathable jacket. It includes what they call the TorsoFlo ventilation design. It implies long zippers on both sides from the hem to the armpit and partly also along the arm. This means that when you open these zippers completely the jacket behaves like a poncho and you have the best possible ventilation coming from below. But you can also open them only partly and use as the usual pit zips. Yet another application of this great design is that you can pass the hip belt of your backpack under the jacket. So with this, you still have an optimal ventilation while being protected. The jacket is highly waterproof and breathable 2-layer Paclite Gore-Tex piece, and the fabric is 100% polyester 50D. You have two side pockets plus one pocket on the left bicep. Note that the jacket stows into one of its side pockets. the hood is with adjustability on all sides, and you have a piece of fabric which you pass over it and roll it away. The front zipper is the two-way type, so this is again a useful feature for ventilation and for situations when you have a climbing harness on or the hip belt from the pack. 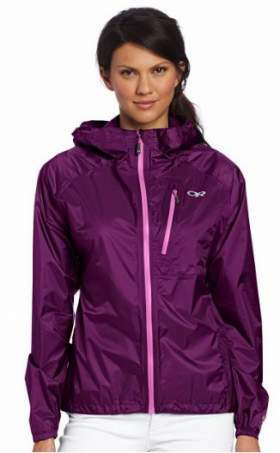 Outdoor Research Helium II Jacket For Women. If you need something extraordinary lightweight for backpacking and hiking, this Helium II is the item to consider. You have only 5.5 oz (156 g), yet this is a fully waterproof and breathable rain jacket built from a 30D nylon ripstop with a 2.5-layer membrane. The meaning of the Ripstop is that if damaged, the damage will not spread. The membrane is Pertex Shield. You might want to see some numbers, so breathability is 20000 g/m². This jacket is indeed for very hard outdoor activities. The waterproofness of the Helium II is 20000 mm/day, so this is in the group of the best possible materials. There are no hand pockets here, you have one single external chest pocket, and one internal pocket which also serves also as a stuff sack. The hood is with a single adjustment cord and a toggle. 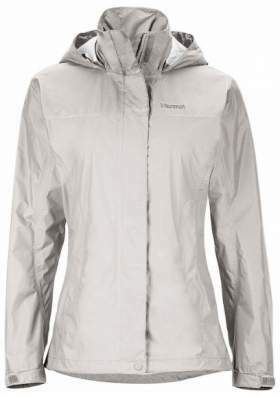 Outdoor Research Interstellar jacket for women. The Interstellar is a hard shell 3-layer jacket, so this is an exceptional quality item. In spite of such a structure, it is very lightweight and very packable. In fact, it packs into its own left-hand side pocket. Here you have a rather special AscentShell membrane sandwiched between the outer ripstop nylon, but this is also a stretch material, quite unusual for a hard shell piece. The jacket is very breathable, fully waterproof and yet air-permeable. So it is very suitable for all sorts of very aerobic activities. There are 3 external pockets, all with the top quality YKK AquaGuard waterproof zippers. The hood is fully adjustable and helmet compatible. The jacket may look expensive, but in fact this is one of the most affordable hard shell jackets on the market. The mentioned AscentShell membrane is an electrospun laminate, thinner and more stretchy than any other hardshell membrane on the market. This is a relatively new material and you will not find it in many jackets around. It is softer and quieter than Gore-Tex Pro. 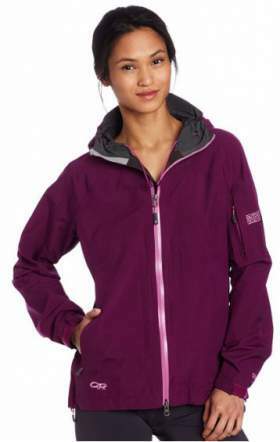 Outdoor Research Optimizer jacket for women. The Optimizer jacket for women is yet another hard shell model here in the list. But here you have the Gore-Tex Active membrane, so this is a 3-layer construction with the external fabric which is a blend of nylon and polyester, then follows the mentioned fully waterproof but very breathable membrane, and then a 20D inner polyester backer. So as you see, this is the top stuff here, the word Active in the name of the membrane implies that this is a piece for very aerobic activities, very breathable but fully waterproof. It is also very lightweight for a hard shell jacket, though slightly heavier than the OR Interstellar jacket shown above; but this is mainly due to the thicker inner backer fabric. The jacket has 4 pockets; 3 are external and one is inside. As you may see from the picture, the hand pockets are positioned quite high, so you can use them even when you have a climbing harness, or when you have the hip belt of your backpack around your waist. The outer pockets are with YKK AquaGuard waterproof zippers. The hood is adjustable and helmet compatible, and with a wire in the brim. 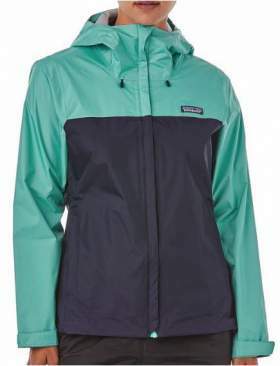 Patagonia Torrentshell jacket for women. If you are concerned about the environment, you would want to know that this 2.5-layer H2No waterproof and breathable jacket is built 100% from recycled materials. This is a lightweight 50D ripstop nylon, quite sturdy and durable, but the weight is only 10.6 oz (300 g). This is a great piece, most suitable for hikers, backpackers, and mountaineers, but you will enjoy using it also in your daily life. Although the material is very breathable, they have added large pit zips for an increased ventilation. The jacket is with a regular fit so you have lots of space for layering and you can use it in all seasons. The hood is the roll-away type, helmet-compatible, adjustable, and equipped with a brim. You have two hand-pockets and the jacket stows in one of them. 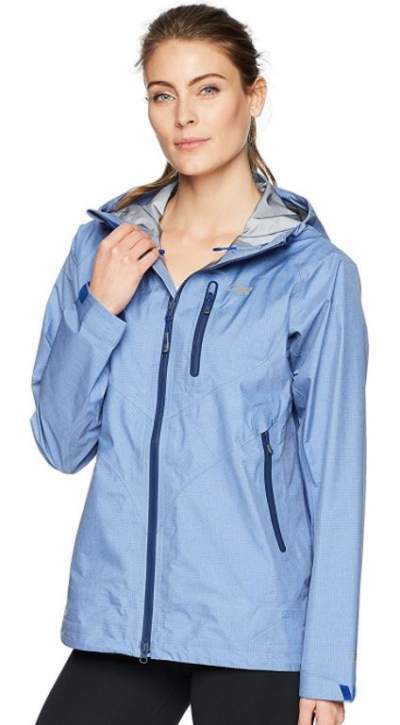 The North Face Resolve Jacket For Women. The fabric you have here is 70D 105 g/m² (3.1 oz/yd²) nylon ripstop and the membrane is 2-layer Dryvent with the impressive waterproof rating of 25 PSI which is equivalent to over 17600 mm. But breathability is far less impressive, only 750-800 g/m²/24 hours average. So this is a jacket for a casual use and for less aerobic outdoor activities, but if you need something to keep you dry this is it. I love the fact that it comes with an additional mesh layer underneath the shell. The hood is helmet-compatible and with adjustability on the sides, and you also have a small brim. It rolls up into the collar. Note that you have only two external hand-pockets but they are nicely designed and with storm flaps. You might want to know that this popular jacket s available in more than 40 colors, and it is very affordable, around $80 or so. 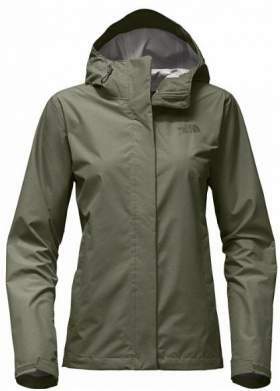 The North Face Venture Jacket For Women. Here you have a jacket with 2.5 layers, and this includes the outer nylon ripstop plus a waterproof membrane which is protected with an extra thin screen. 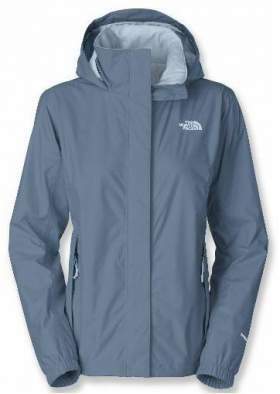 The material is lightweight 40D 85 g/m² and the jacket itself is mid-weight 340 g (11.99 oz). The breathability is not so great but you have pit-zips which will help. But this jacket is more suitable for an outdoor use than the Resolve jacket presented above. The hood is with three points of adjustability and helmet-compatible. You have only two external hand-pockets, and the jacket can be stowed in one of them. Note that there are around 40 color combinations for this jacket, so it is not surprising that it is so popular. If you want to dig deep into the types of waterproof materials, and to read about their possible categorization, I warmly suggest reading my another text about waterproof jackets. In the same text, you can read what to expect regarding the breathability. Not all of them are equally breathable, this all depends on several factors. But if you do not have time for that, then just to know: not every waterproof and breathable jacket is suitable for every activity. Some jackets are more waterproof but less breathable, and you can have it just the other way around in others. If this is about more technical and dynamic activities, and you need a perfect ventilation, then you should go for the Outdoor Research Aspire jacket. This is an award-winning piece of garment. It has long zips all the way from the hem to the armpit and partly along the sleeve as well. No other jacket will give you more ventilation. Do you want something exceptionally packable and lightweight? Then think about the OR Helium II jacket. It is only 156 grams, and it packs into its own pocket. See more in the link above. But what if you definitely need hand pockets (well, who wouldn’t)? Then surely avoid the OR Helium II jacket, this jacket has no hand pockets. You do not want to spend much? Then certainly avoid the Outdoor Research Aspire. Instead, think about The North Face Venture and Resolve jackets. Are colors very important for you? If yes, then check the Resolve jacket; you have more than 40 different colors available. Do you want to have a mesh lining inside the jacket? I love to have it. Such a mesh liner gives volume and warmth, it is also rather pleasant to have in combination with a t-shirt. Some of the rain jackets are with the rubbery waterproof membrane inside, and it is not always pleasant to touch, so this is one extra reason to have a liner. The North Face Resolve jacket comes with a pleasant mesh lining. Note, no other jacket in the list has this feature. How about the hood? As you know, most of the rain jackets come with the hood stowable into the collar. But there are exceptions, The North Face Venture is one of them, and the same is with the OR Helium II, and with the Marmot Minimalist. The OR Aspire jacket is something in between: you have a velcro tab behind the head to keep the hood in place when not used. The North Face Resolve and Marmot PreCip are with a proper roll-away hood design. How about pit zips? I already mentioned the Aspire jacket which is a champion in this regard. But, both Marmot jackets also have pit zips, and the same holds for the North Face Venture. However, the OR Helium II jacket and the North Face Resolve have no pit zips. So, are pit zips essential? I do not think so, in particular, if the jacket is well breathable and if it is more for casual use. Some of the jackets can be packed into their own hand pocket. These are: The North Face Venture, Marmot PreCip, OR Helium II, OR Aspire. The remaining two (The North Face Resolve and Marmot Minimalist) do not have this feature. Internal pocket: only OR Helium II has one. The OR Aspire is the only jacket with 3 external pockets; all other jackets are with 2 external hand pockets, except the Helium II. In my view, the best jackets for a casual use are, in the given order: 1) Marmot Women’s Essential Jacket, 2) The North Face Resolve, 3) The North Face Venture. The remaining jackets are great for outdoor and for casual use. So to summarize, here you have the best waterproof jackets for women, all the models are rather different and with different specifications. It is important to understand that there is no universal multipurpose jacket, but if you insist, I would say that the Outdoor Research Aspire is the closest candidate to this. It is stylish, with a nice design, so definitely suitable as a casual jacket, but at the same time, this is a quite technical tool with excellent specifications and features. Thank you for reading. If you need something similar for men, please check my separate text with great models. If you find the text useful, please share it with others. In the case of questions and comments, please use the comment box below. I wish you a pleasant day. Hi, I’m planning a trip to London (18 June to 20 June & 7 July to 18 July) and to Italy in between. I need your advice on the jackets I should condider getting. I am from Singapore and am not used to the cold. Thx. Hi, this is early summer period so it should not be cold here in EU, so any of these shell jackets will do the job. You did not say where you go to Italy, but if this is in mountains, any of these jackets will be fine unless you go to high elevations. In this case, have a simple and thin fleece jacket as a layer underneath the shell jacket.